Selecting the correct diagram or representation to reason and gain insight is something scientists readily do in their everyday practice. A physicist knows to use a force vector diagram when predicting the path of a particle in a force field. A biologist knows to use the Nernst equation when calculating the resting potential across a cell. A chemist knows to use a ball and stick model when proposing a novel drug and evaluating whether it will dock properly in a cell's receptor. Students, though, can't do this immediately. It takes time and practice! 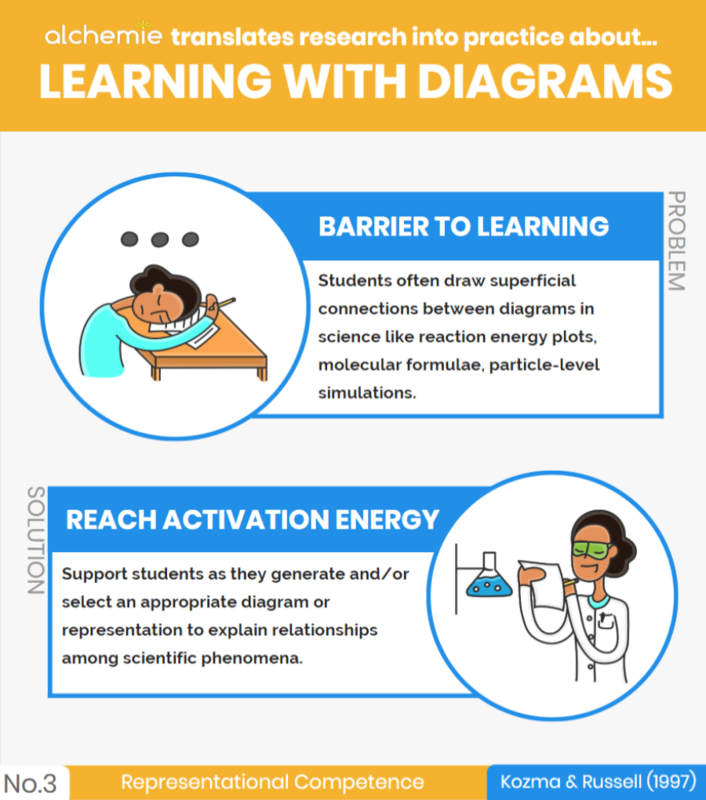 This Flash Point shows instructors how they can use Mechanisms alongside other scientific representations to help students through the complex process of selecting what representation is appropriate when identifying the products of a chemical reaction. Place your students into small groups and inform them that you performed the reaction in EAS Puzzle #11 and that you want them to help you figure out whether you chlorinated the substrate at the ortho, meta, or para position of methyl benzoate. Ask students to first begin by sketching out what the ortho, meta, and para products would look like for a mono-chlorination of methyl benzoate. Reason with students about how this spectrum corresponds to the protons on the ring. Specifically, invoke the principles (1) chemical shift and the effect of electron withdrawing groups and (2) symmetry and the redundancy of chemically equivalent protons on NMR output. The integration of the peaks from right to left are 3:2:1:2. Note: Although the starting material has chemically equivalent protons on the ring due to symmetry, the protons are not magnetically equivalent. This yields a splitting pattern that be may unreliable and difficult to interpret using first-order approximations and without computational techniques. You should instead focus on the fact that there are four distinct signals. Three signals (integration of 2:1:2) are on the benzene ring and one signal (integration 3) is on the methyl ester (-COOCH3) group. 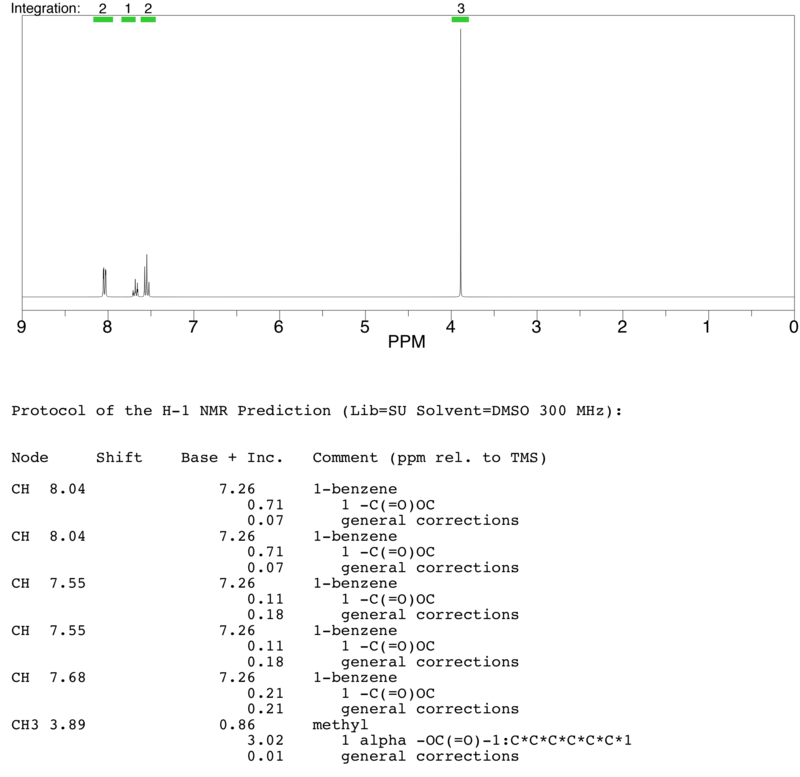 to propose whether the position of chlorine relative to the methyl ester. As soon as a group has a prediction with adequate justification (even if wrong), tell them to check their solution using Mechanisms. Be available to student thinking should they make an incorrect prediction and need to revisit the NMR spectrum. Bring the class back together to work out a mechanism for EAS Puzzle #11 as a group. Emphasize the electron withdrawing nature of a methyl ester and how that makes it a meta director. Ask students: "Why does the presence of the methyl ester drive the formation of the meta product?" This question provides an opportunity to connect back to the resonance structures in Mechanisms. Assign a more complicated puzzle like Electrophilic Aromatic Substitution Puzzle #10. These structures with adjacent methylene groups in a semi-rigid configuration will give rise to non-first order upfield signals that do not need to be interpreted for the task, but may draw attention of students who need more guidance seeing what information is germane and not in the representations. Depending on the prior knowledge of your students, consider providing students with a number of other spectra in addition to 1-H NMR like mass spectra, 13-C NMR, and COSY and ask them to back out both the initial substrate and product. This will test their understanding of spectroscopy and push them to think about which spectrum is most useful in the current context. This activity asks learners to use multiple representations to answer an authentic question that organic chemists often encounter: which of these products is in the reaction flask? The design prompts the student to think carefully about the features of each representation, namely the correspondence between structural details of the molecule, the overall symmetry of the molecule, and peaks in the NMR spectrum.